NAERIC registered Charleswood Rictor, a black four-year-old registered Percheron gelding, took top honours as overall Grand Champion Gelding in back-to-back events in July 2008 at the Calgary Stampede Draft Horse Show, Calgary, Alberta and World Percheron Congress, Toronto, Ontario, Canada. Bred by equine ranchers Kent and Marnie Anderson, Charleswood Percherons, of Pilot Mound, Manitoba, Charleswood Rictor was sold as a three-year-old to Gord and Shannon Ruzicka of Viking, Alberta. Their daughter, Nicole, drove Charlestown Rictor to victory in the Junior Driver Team Class for another win at the World Percheron Congress. Charleswood Rictor`s sire, DA-KA Emperor`s Trooper and his dam, Charleswood Dena, still reside at Charleswood Percherons. The Calgary Stampede, billed "The Greatest Outdoor Show in the World", is one of Canada`s largest annual events and includes an internationally recognized Heavy Horse Show, featuring over 250 Belgian, Clydesdale, Percheron and Shire Draft horses at their best. 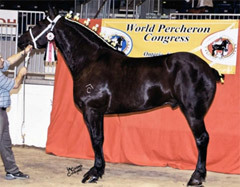 The World Percheron Congress is a prestigious competition held every four years in North America and is attended by contenders for coveted titles from around the world. Horses which place at this competition are not only best in their class, but are also among the best in the world. Good Advice...European Hunt Seat Chamption! 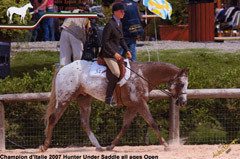 NAERIC registered Good Advice is the 2007 Hunter in Hand and Hunter Under Saddle Champion in Italy, France and Europe. International Top Ten listing, multiple point earner in these events and Western Pleasure. In 2008, Good Advice completed ROMs in Hunter In Hand, Western Pleasure and English Pleasure and was a National Champion in France in Junior Western Pleasure and All Ages Hunter Under Saddle. He also earned medallions at the 2008 European championships. March 2009 - Five-year-old CanAm Sport Horse Super Seven, owned by Dorsch Farms and ridden by Don Dorsch, dominated the Hunter division at the Royal Manitoba Winter Fair in Brandon, Manitoba, March 30 � April 5, 2009. Super Seven earned the title of Grand Champion 2�9� Hunter, Senior Low Hunter and Open Low Hunter. He was also Champion Five-Year Old and Champion Canadian Sport Horse in the 2009 Young Horse Championships. 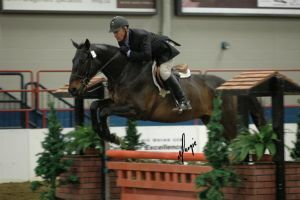 In 2008, Super Seven won the four-year-old division of the Manitoba Young Horse Championships held during the 2008 Royal Manitoba Winter Fair. Super Seven was bred by Ravine Ranch Sport Horses. His sire is Samual; Registered Hanoverian, and his dam is Hurry Hussey; Registered Thoroughbred. The Young Horse Championships are designed to showcase young Canadian-bred horses. Competition consists of four classes: conformation, hack, hunter and jumper. Points are awarded for each class and the horse accumulating the most points is declared Champion. In addition to the cash prize awards for each class, Super Seven, registered with NAERIC, collected additional money from the NAERIC Advantage� rewards program. 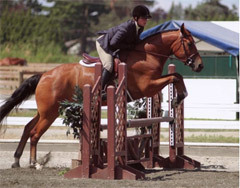 Kalan, a four-year-old CanAm Sport Horse, was a model of consistency winning 2nd in all four classes and being named Reserve Champion Baby Green Hunter at the 2008 Milner Downs Summer Classic II, British Columbia. Kalan is sired by the registered Thoroughbred stallion Expect Greatness and out of a cross-bred Percheron mare. Bred by Cancade Farms, Kennedy, Saskatchewan, Kalan is currently owned by Pat DuMont, Aldergrove, British Columbia. Mike Row and NAERIC Registered Apache Blue Boy "Head" for the Winner`s Circle in Another AQHA World Championship Show! After capturing three of the last four Amateur World Championship titles in Heeling together, and collecting a reserve World Championship last year, Mike Row and Apace Blue Boy, a 1995 flashy grey stallion, beat out 52 entries with a whopping score of 226 to handily to win their first Amateur Heading title at the American Quarter Horse Association (AQHA) World Championship Show in Oklahoma City, Oklahoma, on November 12, 2008. "I`m very, very blessed to have this horse and be able to show him," said Row, of Tishomingo, Oklahoma. "Words can`t describe how I feel." Prior to the championships, Apache Blue Boy, (Blue Boy Doc x Apache King Miss by Boston Apache) owned by Mike`s father John Row, also of Tishomingo, had earned $63,407.00 in AQHA World Champion Show prize money. Since the AQHA World Championship Show is an approved event under the NAERIC Advantage®, an incentive program that rewards NAERIC registered horses, Apache Blue Boy`s 2008 World Show earnings have been matched, dollar for dollar, boosting his total World Show earnings to $128,814.00! As a result of competing at an AQHA World Championship Show, Apache Blue Boy earned the distinct honor of becoming the first NAERIC registered horse to earn matching funds through the NAERIC Advantage®. Mike Row competes with Apache Blue Boy in the Amateur Roping events, while professional trainer Steve Orth, of Guthrie, Oklahoma, keeps the horse tuned and competes in the Open Roping events. When he`s not competing, Apace Blue Boy performs the time-honored traditions of tending cattle and breeding mares at the R & S Cattle Ranch owned by John Row. 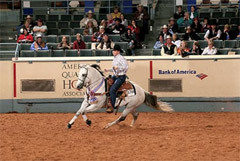 AQHA World Championship Shows are held annually in November in Oklahoma City, Oklahoma. Horses must qualify to compete at AQHA World Championship Shows by earning a predetermined number of points in each event at AQHA approved competition held during the 12-month period ending July 31st of each year. Apache Blue Boy qualified in a number of events in order to compete at the 2008 show. The AQHA World Championship Show is the pinnacle event for American Quarter Horse exhibitors around the world and it attracts more than 3,400 entries from the United States, Brazil, Canada, Germany, Italy and the United Kingdom annually.